Synthetic peptide conjugated to KLH derived from within residues 750 to the C-terminus of Fruit fly (Drosophila melanogaster) GM130. Our Abpromise guarantee covers the use of ab30637 in the following tested applications. WB Use a concentration of 0.1 µg/ml. Detects a band of approximately 95 kDa (predicted molecular weight: 95 kDa). Golgi auto-antigen; probably involved in maintaining cis-Golgi structure. Belongs to the GOLGA2 family. Extended rod-like protein with coiled-coil domains. Golgi apparatus > Golgi stack membrane. The image shows staining of Drosophila S2 cells using ab30637 to cis-Golgi/Golgi marker, GM130. For comparison, S2 cells were stained with an antibody to the trans-Golgi marker, GCC88. Gm130 stained the cis-Golgi region and appears to be a superior Golgi marker to GCC88. Immunocytochemistry/ Immunofluorescence - Anti-GM130 antibody - Drosophila Golgi/Cis-Golgi Marker (ab30637)Image from Zhang L et al, J Biol Chem. 2010 Jun 18;285(25):19491-501. Epub 2010 Apr 6, Fig 1. DOI 10.1074/jbc.M109.098145 June 18, 2010 The Journal of Biological Chemistry, 285, 19491-19501.
ab30637 at a 1/100 dilution staining Golgi/Cis-Golgi in Drosophila S2R+ cells by Immunocytochemistry/ Immunofluorescence. Expression of recombinant wild type pgant3 (pIB-pgant3-V5), pgant3m1 (pIB-m1-V5), and pgant3m2 (pIB-m2-V5) in Drosophila S2R+ cells. Cells were then stained for V5 and the Golgi marker GM130 revealing Golgi localization of wild type pgant3 and pgant3m1. Additional bands at: 70 kDa. We are unsure as to the identity of these extra bands. Publishing research using ab30637? Please let us know so that we can cite the reference in this datasheet. Did you do a permeabilization step (details please) or add permeabilizing agent in any dilution buffers? Thank you for your enquiry regarding ab30637 and for taking the time to provide some useful details of the experiments. I am very sorry to hear that you are having problems with this antibody. 1) This is a polyclonal antibody and there may be batch-to-batch variations. I would suggest increasing the working concentration to 1 µg/ml (overnight incubation at 4oC) as suggested on the on-line datasheet under the Application note. 2) Does the detection system work fine? Have you used it successfully with another primary antibody? Have you run a no primary - only secondary antibody - control to see if any of the non-specific bands are due to the secondary or not? Dear Sir/madam That sounds great. Here the detailed protocol we used and trouble shooting steps followed: 1. Drosophila eye imaginal disc were fixed in 4% paraformadehyde for 30 min and washed thrice in PBS.2. Samples were blocked with 2%BSA, 2% donkey serum, 2% Goat serum in PBT for 1 hr at room temperature.3. Samples were incubated with primary antibody (dilution 1:150) prepared in blocking solution for overnight or 16hrs at 4C.4. Samples were washed at Room temp with PBT for 1hr and incubated with appropriate secondary antibody from Jackson immunoresearch for 1hr.5. After a brief wash for 1hr with PBT, samples were mounted in Antifade (Vector shield). Trouble shooting steps: Varied concentration of antibody and pre-absorbed the antibody in WT embryos to get rid of non-specific signals. But did not help. Hope this protocol helps, and we look forward in getting the new aliquot of GM130 - Drosophila specific antibody soon. Thanks a lot. Thank you for confirming these details and for your cooperation. The details provided enable us to closely monitor the quality of our products. I am sorry this product did not perform as stated on the datasheet and for the inconvenience this has caused. As requested, I have issued a free of charge replacement with the order number. To check the status of the order please contact our Customer Service team and reference this number. Please note that this free of charge replacement vial is also covered by our Abpromise guarantee. Should you still be experiencing difficulties, or if you have any further questions, please do not hesitate to let us know. I wish you the best of luck with your research. I sincerely don't think, its because of antibody staining protocol or antibody concentration because : I used the last traces of an old aliquot of same antibody from your company (stored at -20) following my routine staining protocol in same tissue - it worked excellent as it supposed to be. But simultaneously, When I tried the new aliquot of the same, it gave lots of non-specific background. Both experiments were done simultaneously in same tissue. May be the antibody spoiled, during transit. So we request to replace the antibody. I would like to thank you for your response. If the product has gone off we will gladly replace it. However the procedure for this is that we have the protocol used and troubleshooting steps that you have performed for our records. I do apologize for any inconveniences this might cause. If you would you be able to send that information to me I would be able to being processing this for you. I am writing to you about Drosophila specific GM130 antibody problems that we had last time. For the last 2 years we have ordered GM130 antibody (cat.#: ab30637) four times and first three times antibody worked perfect. 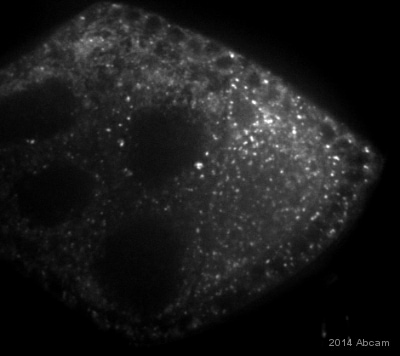 The latest aliquot of Drosophila specific GM130 antibody which we received a month before, is not perfect as it used to be. It does label golgi organelles but the ratio of signal to noise is very high. Other than golgi, the antibody also labels other cells, plasma membrane. These experiments were done in wild type tissue where the antibody worked excellent before. Also we extensively used the same antibody from your company before, without any problems. So we request you to replace this antibody. I am sorry to hear of the difficulties that you have been experiencing using this product. Would you mind sending me the details of your protocol including the tissue type you are working with and your sample preparations? Could you also include any antigen retrieval steps you use, blocking solution and incubation information and the antibody concentrations that you have tried. Any images that you may have and any steps that you have changed while troubleshooting would be extremely helpful as well. It seems unlikely that your protocol is the issue here but these details will not only help me to better understand your difficulties, they are also used for internal testing of the products if deemed necessary. If we are unable to solve the problems you are experiencing we will replace or refund the antibody according to our Abpromise guarantee. Thank you for your email. Our customer has made some comments based on your suggestions as shown below. The customer also sent an image without DAPI staining as you requested. (It is in the attached file.) Please review the email and let us know. Thank you. Comments from customer are in Bold characters - Increase blocking time from 30 minutes to 1 -1.5 hours. : Blocking time is 30 min for Drosophila cells (SL2 cell) and 1.5 hr for Drosophila eye tissue in regular protocol. Even though they were different tissue, we still observed same pattern on both eye tissue and SL2 cell. - Could I ask were the cells healthy? The cell was freshly prepared. We used the second passage of SL2 cell from stock and they were very healthy. - Could you provide details of fixative agent used; how the fixation was performed? SL2 cell: 4% formaldehyde (prepared from powder) in 1XPBS drosophila eye: 4%formaldehyde(from 37% formaldehyde solution) in 1XPBS - Could you send us an image of no DAPI control image? Please check the attached file. Thanks you very much for sending us more details about the experiment. I am sorry I am not sure why the antibody staining appears spotty. 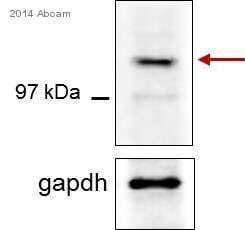 This antibody was used in many publications without problem. So perhaps you have received a bad vial of this product or somehow the sub cellular architecture of the Golgi apparatus collapsed and formed blubs that now appears as spots. To further rule out the problem because of bad vial, I can either send you a new free of charge vial of ab30637 from different lot or a new antibody against the same target. Could you specify which option you would like to go for? I will look forward to hearing from you soon. LOT NUMBER GR49551-1 ORDER NUMBER 954043 DESCRIPTION OF THE PROBLEM Non-specific staining SAMPLE drosophila SL2 cell, drosophila pupa eye PRIMARY ANTIBODY Concentration or dilution 1:1000(Ab 1ug/ml) Diluent buffer : PSBT(1XPBS+0.1%triton-X) Incubation time : overnight at 4℃ Wash Buffer : 1XPBS Number of washes : 3time DETECTION METHOD - POSITIVE AND NEGATIVE CONTROLS USED - ANTIBODY STORAGE CONDITIONS -20C FIXATION OF SAMPLE Yes/No - yes If yes: Fixative agent and concentration Fixation time : 10min Fixation temperature : 25℃ ANTIGEN RETRIEVAL - PERMEABILIZATION STEP - BLOCKING CONDITIONS Blocking agent (eg BSA, serum…): normal goat serum Concentration : 10% in PSBT(1XPBS+0.1%triton-X) Blocking time : 30min Blocking temperature : 25℃ Endogenous peroxidases blocked? - No SECONDARY ANTIBODY Secondary antibody: jackson fluorescein(FITC)-conjugated Affinipure Goat anti-Rabbit IgG(H+L) (cat No. 111-095-003) Species : rabbit Isotype: Reacts against : No Concentration or dilution : 1:100 Diluent buffer : PSBT(1XPBS+0.1%triton-X) Incubation time : 2hr at 25℃ Fluorochrome or enzyme conjugate : FITC Wash Buffer : 1XPBS Number of washes : 3time HOW MANY TIMES HAVE YOU TRIED THE APPLICATION? 3 HAVE YOU RUN A "NO PRIMARY" CONTROL? No DO YOU OBTAIN THE SAME RESULTS EVERY TIME? Yes WHAT STEPS HAVE YOU ALTERED? - ADDITIONAL NOTES GM130 reported as golgi marker but it showed some clot in DAPI stained nucleus. Thank you for contacting us and for sending the images. I believe the problem is not due to antibody so I would suggest the following - The antibody is showing consistent results in cells outside the marked area. It looks similar as publication and image on the datasheet. So I am presuming that antibody is fine. However I do not know the reason of blobs that appear in cell centre. These could be due to different reason so may be protocol optimizations can help. My recommendations are - Use higher dilution of primary and secondary antibody. - Increase blocking time from 30 minutes to 1 -1.5 hours. - Could I ask were the cells healthy? - Could you provide details of fixative agent used; how the fixation was performed? - Could you send us an image of no DAPI control image? I look forward to hearing from you soon.